The holiday gift giving season is well and truly behind us, so I feel totally safe in talking about this. Readers may remember that back in October 2011 Jim and I did a TON of shopping at Celebrate Samhain, and one of the things I bought was a small, beautiful Hanged Man from Mike Dolan at Haunted Wood Crafts. What I didn’t mention at the time is that Jim and I liked it so much that we decided to get tarot cards done for the bulk of our friends for the holidays! It took a lot of time on our part. We made a list of everyone we wanted to give them to and then went through the Universal Waite Tarot (or Rider-Waite Tarot, or Smith-Waite Tarot, however you prefer) and “The Pictorial Key to the Tarot” by Arthur Edward Waite doing our best to attempt to pick out cards we felt best suited each person. It was difficult, but fun. Of course things were simple when we contacted Mike through his online retail website, The Haunted Wood Online. The next thing we knew we had a big ol’ box of beautiful, framed pieces of wooden tarot art! To complete the gift we made a small card to go with each frame that included keywords associated with the card, or a quote from “The Pictorial Key to the Tarot” that hopefully expressed why we thought that card suited the recipient. I think most everyone really enjoyed the gift. Now Jim and I couldn’t get all those awesome looking cards done without getting some for ourselves too. What’s funny is, neither of us put any thought at all into the cards we chose. For some reason I’ve always like the Hanged Man, so I picked that one. I asked Jim what his favorite card was and he said The Magician, so I ordered that one for him. I didn’t ask him why, and I suspect, like me, he doesn’t have a specific reason for it. 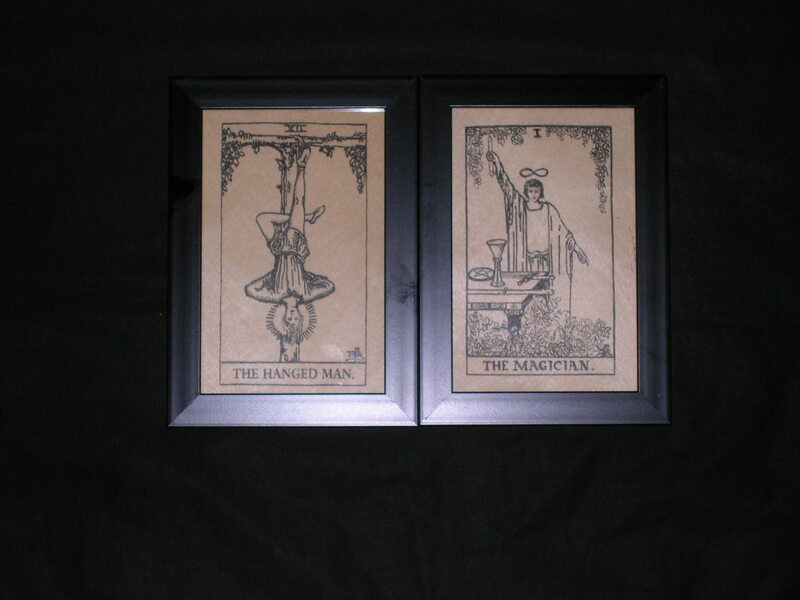 So here we are, the Hanged Man and The Magician. The happy couple. Perhaps any of my readers who are good with the tarot can tell me if there is any significance to a Magician and a Hanged Man hooking up. All I can tell you is, it seems to be working out pretty well.